The cave diving community mourns the early passing of legendary cave diver Wes Skiles at 52. Skiles died on Wednesday 21st July 2010, whilst diving off Boynton Beach, Florida (USA) on a project for National Geographic. Wes Skiles | Photo: Gainesville SunA native of Florida, Skiles began diving at age 13. He was certified as a cave diver at 16 and his first cave dive with another legend, Sheck Exley, was the recovery of two divers who drowned in Royal Spring. Skiles was certified as an open water instructor, and in 1982 he was training chairman of the National Speleological Society, Cave Diving Section (NSS-CDS) during Florida cave diving's most deadly period. 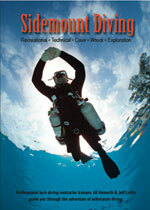 Over the next 35 years he would become known as one of the key architects of cave and technical diving. Skiles was a pioneering underwater cinematographer and still photographer, often working with scientific research teams to explore the inaccessible. Skiles' work photographing and filming Florida's springs, rivers and underwater caves opened viewers' eyes to a hidden world that most never knew existed. During the past 15 years, Skiles produced and directed over a dozen major films on adventure and science. His work included most recently the IMAX film "Journey into Amazing Caves" and a film for National Geographic in Antarctica on exploring the largest iceberg in recorded history. He shot the August 2010 National Geographic cover photo of caves in the Bahamas. Skiles link to Australia came in 1988 when he was invited by Andrew Wight to the Nullarbor to explore and film Pannikin Plains cave for the documentary "Nullarbor Dreaming" with a team of Australian cave divers. The expedition almost ended in disaster when a freak storm dumped 400mm of rain in 25 minutes on the plain above causing an estimated 300 million litres of water to flow into the cave collapsing part of the cave entrance and trapping most of the team below ground. Skiles was a consumate professional, filming his own precarious exit from the cave about 24 hours later as he crept through the very loose rockfall while whispering a running commentary into his camera. Skiles had both a film production company, Karst Productions, and a hydrological consulting firm, Karst Environmental Services. He is survived by his wife Terri and two children.